With little discussion or fanfare, Ohio legislators have essentially put a stop to new wind farms in the state, industry experts say. Governor John Kasich signed House Bill 483 on Monday, just days after signing another bill that freezes and alters Ohio’s renewable energy and energy efficiency standards. HB 483 includes revised setback provisions that will likely make new projects economically unfeasible. 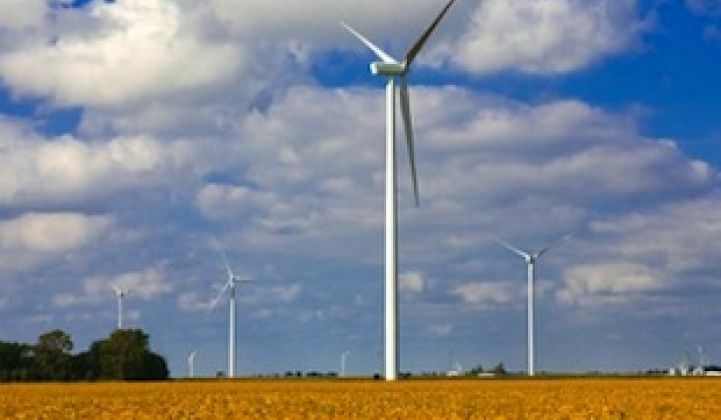 The bill “basically zones new wind projects out of Ohio,” according to Eric Thumma, Director of Policy and Regulatory Affairs for Iberdrola Renewables, Inc.
Iberdrola’s Ohio wind farm projects include the 304 MW Blue Creek Wind Farm in Van Wert and Paulding counties. Around ten of the company's Ohio projects are fully permitted, but not yet constructed. The new law lets already-permitted projects continue, but only if no amendments to the permit become necessary. Two additional projects in Putnam County and Van Wert County have not yet been permitted. Those probably will not go forward as a result of HB 483. For any new commercial wind farms, HB 483 will now require a setback of 1,125 feet from the tip of a turbine’s blades to the nearest property line. In practice, that will translate to setbacks of about 1,300 feet from each turbine’s base. The new law makes an exception for existing facilities and ones that had already received permits. For those projects, the Ohio Power Siting Board measured the 1,125-foot setback to the outer wall of the “nearest habitable residential structure” on neighboring property. Otherwise, property line setbacks were roughly 550 feet. HB 483 is part of Kasich’s mid-biennium budget review, and most of the law deals with tax cuts, spending for social programs, and other matters. An earlier version of the bill would have doubled the maximum penalties for violations of gas pipeline rules. The Ohio House Finance Committee deleted that provision. The wind setback provision appeared for the first time when the Ohio Senate Finance Committee reported the bill out in May. “There was literally no public testimony” on the new setback provision, according to Dayna Baird Payne. The Columbus lobbyist represents the American Wind Energy Association, as well as Iberdrola. “They didn’t consult with industry. They didn’t consult with the Ohio Power Siting Board, which sites wind farms in Ohio,” Payne added. Indeed, the Ohio Senate spent barely ten minutes discussing the last-minute changes before passing the bill on May 21. “A provision like this to change the setbacks will significantly hurt those projects in the pipeline and will significantly hurt jobs in Ohio,” protested State Sen. Mike Skindell, a Democrat from suburban Cleveland. “It’s really a bill that has the effect of making wind an uneconomic resource in Ohio,” Thumma said. If HB 483’s setback had applied to the Blue Creek Wind Farm, only about a dozen of its 152 wind turbines could have been built. “These are large capital projects,” stressed Thumma. To justify that expense, wind farms need sufficient turbines to produce enough electricity so they can make a profit. “You have to maximize that within the concept of public safety” and other factors, Thumma continued. That means accounting for general safety, possible ice throw, sound levels, and potential flicker effects. Analyzing all of those factors requires substantial analysis and engineering. Commercial wind farm developers aren’t the only ones who will lose out. Projects often use local labor to build and maintain equipment. “This is a job killer,” Skindell said when he tried to get the provisions removed from HB 483. Ohio farmers will lose money too. Wind energy companies generally place turbines on agricultural land leased from rural farmers. In return, each farmer gets guaranteed income. Last Friday, Kasich also signed Senate Bill 310 into law. The bill freezes Ohio’s clean energy law for two years and then dramatically changes the renewable energy and energy efficiency standards. Getting hit with the new wind setbacks plus the overall impacts of Senate Bill 310 is “kind of a double whammy,” said Spratley. Among other things, SB 310 eliminates the in-state requirement for renewable energy. The law also broadens the scope of what counts under the standards. Both changes will likely lower demand for Ohio-based wind energy and other forms of renewable energy. “You would have Ohio ratepayers paying for existing resources in other states and not getting any benefit for it,” Thumma said. Moreover, it’s not clear whether even the relaxed standards will kick back in after the two-year freeze. Even if the freeze is just temporary, the uncertainty will disrupt business planning. That will increase the business risks for existing and planned clean energy projects. Potential new projects will become even more uncertain. The uncertainty “over time is just going to dampen investment,” said Thumma. Ohio will become “just too risky a place” for companies to invest millions in capital resources. The freeze, the study committee, and other provisions send “a signal that renewables aren’t going to happen in Ohio -- certainly in the near term and under the structure of SB 310,” Thumma said. “It’s the worst possible law you could write,” Thumma added. Editor's note: This article is reposted from Midwest Energy News.